« What Happens When Too Many Voters Support Redistribution? The United Nations is not nearly as bad as other international bureaucracies such as the Organization for Economic Cooperation and Development or the International Monetary Fund. But that’s because the U.N. tends to be completely ineffective. So even when the bureaucrats push for bad policy, they don’t have much ability to move the ball in the wrong direction. But just like a blind squirrel occasionally finds an acorn, the United Nations periodically does something that genuinely would expand the power and burden of government. But this isn’t the usual junket. The bureaucrats are pushing to create “guidelines” for tobacco taxation. Most notably, they want excise taxes to be at least 70 percent of the cost of a pack of cigarettes. I’m not a smoker and never have been, but this is offensive for several reasons. If there were five gas stations in your town and the owners all met behind closed doors to discuss pricing, would the result be higher prices or lower prices? Needless to say, the owners would want higher prices. After all, the consumer benefits when there is competition but the owners of the gas stations benefit if there’s a cartel. The same is true with government officials. They don’t like tax competition and would prefer that a tax cartel instead. And when tax rates get harmonized, they always go up and never go down. Which is what you might expect when you create an “OPEC for politicians.” In their minds, if all governments agree that excise taxes must be 70 percent of the cost of cigarettes, they think they’ll got a lot more tax revenue that can be used to buy votes and expand government. In the previous paragraph, I deliberately wrote that politicians “think they’ll get” rather than “will get” a lot more tax revenue. That’s because, in the real world, there’s a Laffer Curve. We have lots of evidence that higher tobacco taxes don’t generate revenue and instead are a boon for smugglers, criminal gangs, and others that are willing to go underground and provide cigarettes in the black market. We saw this in Bulgaria and Romania. We saw in in Quebec and Michigan. And we saw it in Ireland and Washington, DC. As I explained a couple of years ago, “In many countries, a substantial share of cigarettes are black market or counterfeit. They put it in a Marlboro packet, but it’s not a Marlboro cigarette. Obviously it’s a big thing for organized crime.” And if the WHO succeeds, the problem will get far worse. Or maybe this section should be called eroding democratic accountability and control. In any event, the issue is that international bureaucracies should not be in the position of seeking to impose one-size-fits-all policies on the world. Particularly when you get perverse results, such as bureaucrats from health ministries and departments supplanting the role of finance ministries and treasury departments. Or when the result is earmarked taxes, which even the IMF warns is problematical since, “Earmarking creates pots of money that can invite corruption and, unchecked, it can lead to a plethora of small nuisance taxes.” And keep in mind the WHO operates in a non-transparent and corrupt fashion. For more information, Brian Garst of the Center for Freedom and Prosperity has a thorough analysis of the dangers of global taxation. By the way, the health community will argue that globally coerced tobacco tax hikes are a good idea since the money can be used to fund programs that discourage tobacco use. Yet we have some experience in this area. Many years ago, state politicians bullied tobacco companies into a giant cash settlement, accompanied by promises that much of the money would be used to fight tobacco use. But, as NPR reports, politicians couldn’t resist squandering the money in other areas. So far tobacco companies have paid more than $100 billion to state governments as part of the 25-year, $246 billion settlement. …all across the country hundreds of millions of dollars have gone to states, and the states have made choices not to spend the money on public health and tobacco prevention. …Myron Levin covered the tobacco industry for the Los Angeles Times for many years and is also the founder of the health and safety news site Fair Warning. He says talking states into spending settlement money on tobacco prevention is a tough sell. 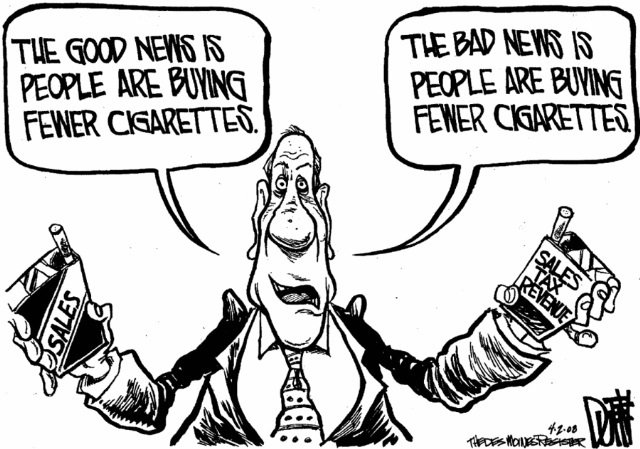 Even when the politicians are asked to spend only a tiny fraction of the money on anti-smoking programs. To help guide state governments, in 2007 the Centers for Disease Control and Prevention recommended that states reinvest 14 percent of the money from the settlement and tobacco taxes in anti-smoking programs. But most state governments have decided to prioritize other things. Needless to say, governments around the world will behave like state governments in America. Any additional tax revenue will be used to expand the burden of government spending. Let’s close with some big-picture analysis. Bureaucracies inevitably seem drawn to mission creep, which occurs when agencies and departments get involved in more and more areas in order to get more staffing and bigger budgets. But when that happens, the core mission tends to get less attention. For many bureaucracies, that probably doesn’t matter since the core mission probably doesn’t have any value (HUD, anyone?). But presumably there is a legitimate government role in preventing something like infectious diseases. So why isn’t WHO focused solely on things such as Ebola and SARS rather than engaging in ideological campaigns to expand the size and scope of government?